I think I am finally, finally, FINALLY present and accounted for. Alive again in my own life. Home at last. I slept for 9 and a half hours last night — uninterrupted except for the very nearby passing of a railroad train (see photo somewhere below that shows just how close the train tracks are to my new house). I never sleep for more than about 7 hours, so getting so much uninterrupted sleep was kind of shocking to me, but in a good way. And I had these really great, vivid, active dreams about — guess what? — moving into a new house that had tons of windows! I can’t remember the last time (or if ever) I had a dream that was not only happy but that also reflected the actual life I was currently living. How do you process that? Dreaming happy, then waking up happy, then remembering I had a happy dream, and then realizing, oh, that’s just like my life right now! Like, did I die and I haven’t yet figured out that I died? I guess time will tell! Anyway, it’s been a bit of a week. Before I went into contract on this house that I ended up buying, some other people were under contract to buy the house but their mortgage was declined. However, before their mortgage was declined, they set about making improvements to the house — wiring and plumbing. But when the mortgage was declined, they dropped everything and simply walked away, leaving things half-done. So, imagine my surprise when it became suddenly clear that my kitchen was a wiring nightmare and a serious fire hazard. Things were turning off & on by themselves; outlets were melting. And then, wafting up into my conscious awareness comes: Ah, so this is what he meant by get an electrician in here. I wonder if I’m ever going to get tired of the excitement of the train rushing by? It goes by about once a day, and a few nights a week. (And by “night” I mean 3 o’clock in the morning.) First, it’s the “ding ding ding ding” of the gates lowering while the red lights start flashing; then the train whistle starts screaming in the distance and I can feel the rushing rumble coming my way. This is when the cats scurry and hide, whereas I rush to one of my many windows in anticipation of that monster train coming into view and then hurtling past. Awesome, in an otherwise serene and quiet town. Oh, but here’s another thing I love. The guy next door (married with very young children) has a rock band and they occasionally practice out in his garage. It’s down at the end of the backyard, out on the alley, next to where my horse & buggy barn is. The sound is not deafening, but I can certainly hear it. Some sort of death-metal type tempo. And while death-metal wouldn’t be listed up there as a favorite musical genre of mine, as someone who was a professional musician/singer/songwriter for a really long time, the sound of that band practicing in the garage always brings a smile to my face. While everything imaginable in my own personal life has changed, in other outer, outside world ways, nothing changes. And that is comforting. So. I had a conference call with Sandra yesterday and now we must get back on track. Rehearsals for the staged reading (in NYC) of the one-woman musical The Guide to being Fabulous begin on April 14th in Rhinebeck, NY. The staged reading is for production funds for mounting the show Off-Broadway at (if I may say so myself) a really prestigious Off-Broadway venue in midtown. So it is very exciting, folks. All right. Enjoy Good Friday, wherever you are, gang. Remember, Good Friday is a reminder that all of life is re-born, it never dies, we’re all sacred, eternal, joyful beings, created as we are creating. What could be better than that? Okay! Thanks for visiting, gang! See ya! 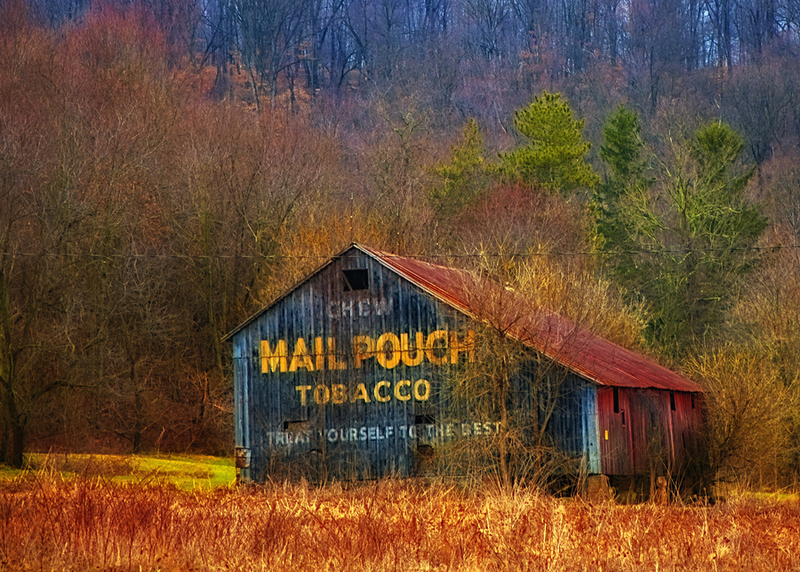 This old barn is just down the road a piece, but it’s been enhanced here by photoshop. The Mail Pouch logo is really, really faded now. Yay! For the first time in about 2 years, I have access to all my books, my movies, my music, my clothes, my dishes, my art. You name it! It if belongs to me, I can now see it again. In my many years of being in limbo (loyal readers of this lofty blog will no doubt recall that for the past 6 years or so, I was planning on moving back to New York. So, even while my possessions were only in storage for about 2 years, my whole life has been in limbo for longer than that). Anyway. I noticed while I was living in that rented house, without access to 95% of my stuff, that I was in fact able to survive without 95% of my stuff… I contemplated renting a dumpster and throwing it all away, sight unseen. Lightening the load of my life, my past, what have you. If I could survive without it, did I really need it? Yet, now that I’m in this really wonderful old house with its wonderful old barn out back, in this indescribably tiny village that has been here for over 200 years and which most people have never ever heard of; and now that all my stuff is unpacked, I realized how much I now enjoy having my identity back! OMG! I’m so glad I didn’t throw it away. All my books. My records and CDs, my collection of movies. Photos , mementos. All these things I love have now been sort of returned to my identity. And I feel like I’ve returned to myself. Like I’m finally really home since leaving New York. When I moved from New York City, and also when I was planning on moving back there, I did indeed throw away a lot of stuff and gave a ton of stuff to various charities. I didn’t just simply hang on to everything. And the outcome of that is that what I did save over the years were things that I didn’t want to part with, regardless of the lack of storage space in some of the places where I’ve lived. So it really was an “OMG” moment (or many moments,) as I was unpacking box after box after box of things I hadn’t seen in such a long time. So many things that I really loved, that added to who I became throughout my (seemingly endless) long, long life. Also, the cats have adjusted beautifully to their new home. They really seem frisky and happy and totally cool with their new surroundings. 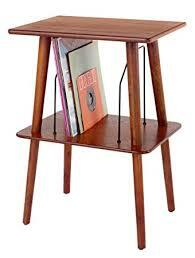 In honor of having all my music back in my life, I bought a really cool Crosley entertainment thingy. 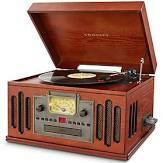 It plays records, CDs, cassettes, has an AM/FM radio, and a bluetooth adapter. It looks like this. It’s too freakin’ pretty! Put them both together, and it is just like living in yesteryear. All righty! So, have a happy Saturday, wherever you are in the world! Thanks for visiting, gang! See ya! Happy St. Paddy’s Day from the Hinterlands! I’m exhausted, gang, but I couldn’t be happier with my new (extremely old) house! And I am so excited that I decided not to have the garage/barn/shed thingy torn down (see post below somewhere that has photos). My guy-friend came out on Wednesday to take measurements for the new roof and it was the first time I actually went inside the old building and it was indeed a barn at one point. In fact, it was built (in 1910) as a horse-drawn buggy barn. One half of the “garage” was the horse’s stall, and the other side, which we plan on turning into a gardening shed, was where the buggy was stored. 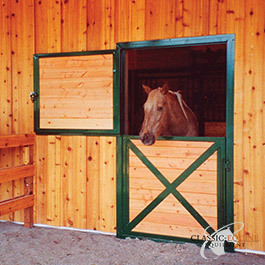 Right down the middle, is a wall with one of those half-doors in it for feeding the horse. It is SO COOL! And it was so well constructed. The roof needs replacing because an enormous maple tree fell on it, but the actual building sustained no damage at all. It is just too cool. I can’t wait until it’s fixed up. I will regale you with photos! Between the train going by, and the church bells ringing, and the birds, the trees, the rolling hills on the far horizon, and the BAZILLION stars at night, I simply could not be happier. Unfortunately, I still have a ton of unpacking to do, so I can’t tarry here on the blog. 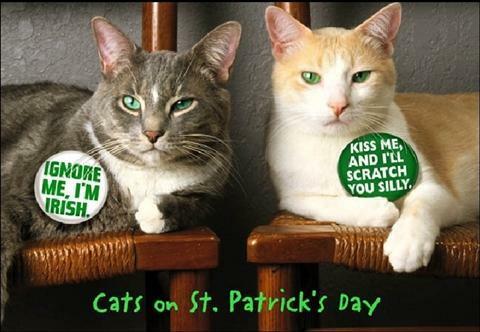 But I do want to mention that not only is it St. Paddy’s Day today, but also the birthday of my many cats!! The three parents are 7, and the “kittens” are 6 years young today. 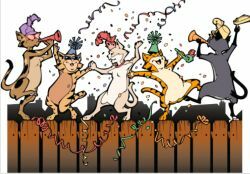 Happy birthday to my many cats!! Okay. Gotta scoot. Thanks for visiting, folks. Have a really fun (and safe — for instance, don’t drink & drive because I can NOT afford to post your bail!!) St. Paddy’s Day, wherever you are. See ya!